Don't you just love a good hybrid? You take a Labrador and a Poodle and you get a gorgeous Labradoodle. You take a plum and an apricot and you get a plucot. You take Brad and Angelina and you get Branglelina...oh wait...that's probably not a good example! What is a good example is these Frownies. 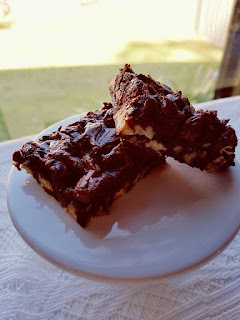 It is a fudge and brownie hybrid. Frownies are delicious, fast to make and best of all need only three ingredients! If you are craving a chocolate hit you can have these made and baked in less than 25 minutes. Enjoy! 1. Preheat oven to 160 degrees. Line a 20cm square baking tin with baking paper with the paper overhanging the sides. 2. Place the chocolate (broken into squares) into the bowl with the kneading blade. Select Speed 3 Temp 85 Time 4 in 30 sec. Start program. After 2 min pause the program and scrape down the bowl and blade. Resume program. 3. Add the condensed milk to the chocolate. Select Speed 5 Time 30 sec. After 15 sec pause the program and scrape down the sides of the bowl and the blade. Resume program. 4. Remove the kneading blade from the bowl and scrape batter off. Add nuts to the chocolate and fold in quickly. Pour mixture into the prepared tin and spread out evenly. 6. Place Frownie in the oven and bake for 18 minutes. 7. Remove Frownie from the oven and allow to cool in the tin for 15 min before lifting out using the overhanging baking paper and allowing to cool on a wire rack. Cut into matchbox size slices to serve.